IKV is represented with several sub-projects in the excellence cluster "Internet of Production", which will receive funding from 1 January 2019 for initially seven years. The "Internet of Production" cluster is based on the work of the Cluster of Excellence "Integrative Production Technology for High-Wage Countries" that has been in existence since 2006 and is now occupied with the digital transformation of production technology. Over 25 institutes and research facilities and more than 80 scientists from the fields of production technology, informatics, material sciences and applied economics have been involved in the research to date. Jointly, they develop engineering methods and processes in order to bring together in the Internet of Production the data obtained during production, and thus make the data accessible and usable across different sectors. Although large volumes of data are created in modern-day production technology, this data has until now been neither readily accessible nor linked to make it interpretable in such a way that knowledge can be generated from it. The Cluster of Excellence entitled "Internet of Production" pursues the vision of enabling a new level of cross-sectoral collaboration by making available semantically adequate and context-related data from development, production and use in real time and at optimum resolution. The utilisation of all relevant data promises a much improved forecasting capability and controllability of production processes and, in connection with machine learning, offers plenty of potential for production technology. The project was launched in October 2006, and from the beginning, IKV has been an active research partner to the excellence cluster “integrative production technology for high-wage countries”, which is funded by DFG, the German Research Foundation. 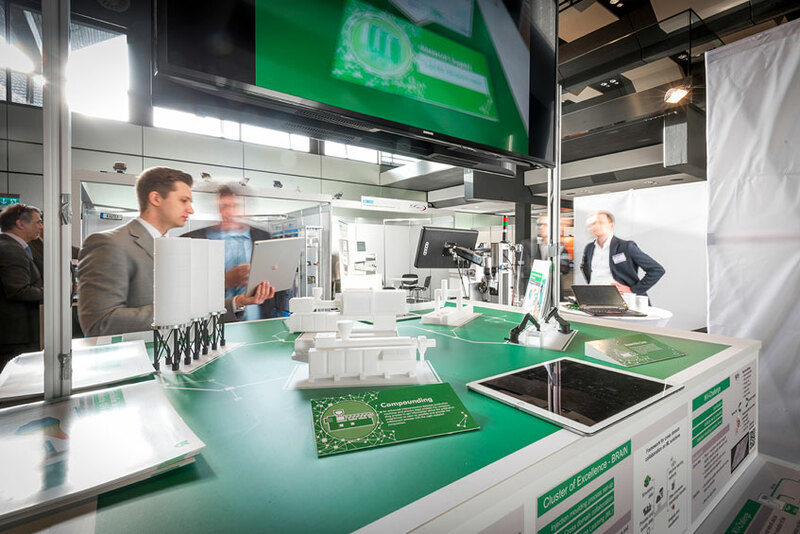 More than 80 scientists from over 25 institutes and research facilities of RWTH Aachen University are involved in research on the future of production technology in Europe. The cluster is basically aimed to strengthen and extend production in high-wage countries, maintaining its high level of competitiveness and, thus, sustainability. Developing new production strategies is at the focus of the investigations, mainly with regard to new dimensions and challenges to production technology, as a result of globalisation. The cluster of excellence stands for high-quality and integrative research in the area of material and production technology at RWTH Aachen University. Alongside the institutes, industrial partners are involved in the investigations. In addition to current projects, further research projects with one or more institutes of the cluster of excellence can be launched at any time. They can be bilateral or conducted in the framework of a research programme. As part of the cluster, IKV is involved in a large number of subjects concerning process technology and material science for plastics. In Germany, this cluster is the only research project of this type concerned with production technology, with plastics technology playing a major part. A flow channel in an extrusion die, if optimized by numerical methods, is impossible to produce by machining, in many cases. However, due to the complex rheological behaviours of polymer melts, optimizing is recommended from the process engineering point of view. The generative manufacturing technique of selective laser melting represents an option to directly produce extrusion moulds optimized with regard to flows. This manufacturing method is subject to research at IKV, the CATS chair at RWTH Aachen University and at the Fraunhofer ILT Institute for Laser Technology, with IKV benefiting from its many years of experience in numerical design of extrusion dies and extrusion process engineering. In this subproject of the cluster of excellence we develop a simulation chain that is independent of scales. It is designed to describe the kinetics of crystallisation for semi-crystalline thermoplastics and their effect on mechanical component behaviour. Multiscale simulation thus enables the user to consider the process of crystallisation during processing and determine the inhomogeneous material characteristics resulting. This description of the relation between the characteristics of process and material in simulation is one of the basic elements of integrative production technology. Self-optimizing processes can optimize their operating points independently, leading to high and consistent component quality, disregard of unavoidable interference effects. IKV research in this area involves development and investigation of quality models for a model-based self-optimizing injection moulding machine. Moreover, working together with the Institute of Automatic Control (IRT) at RWTH Aachen University, IKV develops iterative learning and model-based control strategies for mould internal pressures to enable higher qualities of injection moulded components. The subproject is concerned with investigating a process chain to produce plastics with a microstructural optical appearance, starting from optical design of the structures, via structuring and coating of the mould, replication process, up to performance test. The core competence of IKV, in this field, is analysing and optimizing replication by injection moulding and extrusion embossing by means of variotherm tempering. Including all disciplines relevant to produce plastics with a structured optical appearance enables a holistic view of the production chain, which leads to the highest possible qualities in all stages and for the final product. Combining different types of materials in so-called hybrid structures optimizes the extent to which the user can benefit from the favourable features of the respective class of materials, both in terms of mechanics as well as process engineering. In this field, IKV investigates and develops different joining techniques as well as numerical approaches to manufacture and/or design hybrid components with good crash characteristics. IKV research is concerned with technologies designed for integrative processes to produce plastics parts for application in electronics. Using these processes eliminates process stages, reduces cycle times and steps up overall efficiencies. The integrated metal-plastic injection moulding (IMKS) process combines the technique of injection moulding to the process of die casting. This is done on a single machine and tool, in order to generate plastics parts with metal conductor tracks integrated. In an in-mould-metal spraying (IMMS) process, a metal layer is applied directly on a mould cavity by thermal injection moulding. It is then back-moulded and transferred, thus enabling components with direct EMC compatibility.